Strolling distance to Bourbon Street fun but set just slightly apart from "le bon temps", Dauphine Orleans Hotel is a peaceful hideaway set in a collection of buildings with colorful French Quarter pedigrees. James Audubon painted Birds of America in what's now the breakfast room, and the Victorian-style bar is named for the madam who used to preside over this one-time bordello. Guestrooms are divided between three buildings: Main House (many of these rooms have wrought-iron balconies overlooking Dauphine Street), the Carriage House with its central courtyard, and Hermann House, once the home of a wealthy 19th century merchant. Each room has a touch of French Quarter décor: a painted armoire, French Provincial-style linens, plantation shutters. There's more than bourbon at May Baily's Place: stop by and borrow a book from the lending library to read by the pool. A complimentary continental breakfast buffet with fresh fruit and good coffee is set out each morning. May Baily's Place is a Victorian-style cottage that was once a well-known bordello: admire portraits of madams by E.J. Bellocq while you sip your Sazerac. 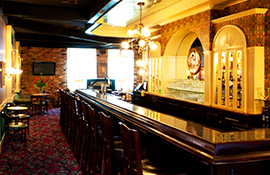 The hotel is in the French Quarter, a short walk from Bourbon Street and the Mississippi River waterfront. Whether you are planning an executive retreat or a board meeting in New Orleans, the Dauphine Orleans Hotel offers attentive service, flexible meeting and event space, and a unique experience for your attendees.